(1) They regulate the con centration of solutes, such as nutrients and ions, in blood plasma, and this also regulates blood pH. (2) They regulate the concentration of water in blood plasma, which in turn helps regulate blood pressure. (3) They remove metabolic wastes and excess substances from the blood plasma. 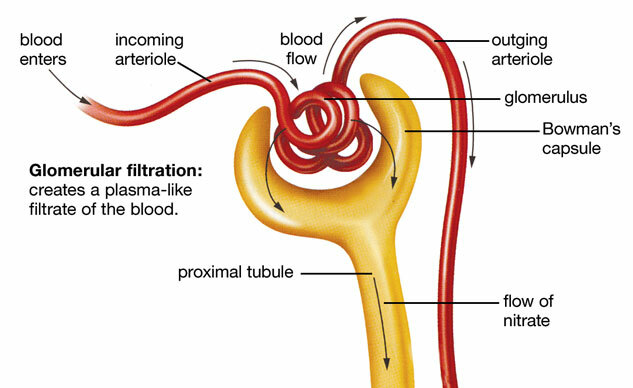 (1) Glomerular filtration moves water and solutes, except plasma proteins, from blood plasma into the glomerular capsule. The fluid that enters the glomerular capsule is called glomerular filtrate. Formed elements normally are not part of the glomerular filtrate. 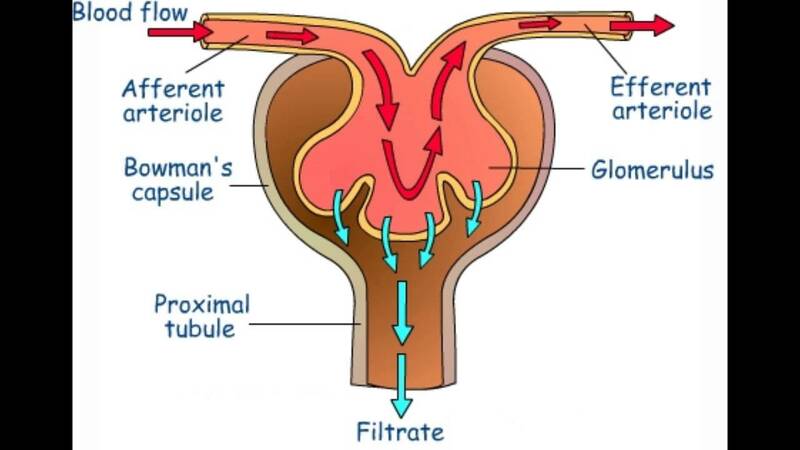 Once the glomerular filtrate passes from the glomerular capsule into the renal tubule it is renamed tubular fluid. (2) Tubular reabsorption removes useful substances from the tubular fluid and returns them into the blood plasma. (3) tubular secretion moves additional wastes and excess substances from the blood plasma into the tubular fluid. (4) Water conservation removes water from the urine, returning it into the blood plasma. (1) the increased permeability of glomerular capillary walls. (2) the elevated blood pressure within the glomeruli. Glomerular capillaries are much more permeable to substances in the blood plasma than are other capillaries because their walls contain numerous pores. These pores allow water and most dissolved substances to easily pass through the capillary walls into the glomerular capsules. Unlike other capillaries, glomerular capillaries are enveloped by specialized cells called podocytes, which have numerous fingerlike cellular extensions that wrap around the capillaries. Podocytes help prevent plasma proteins, and formed elements from entering glomerular capsules. The elevated glomerular blood pressure results because the diameter of the efferent glomerular arteriole is smaller than that of the afferent glomerular arteriole. Because blood can enter a glomerulus at a faster rate than it can leave it, the greater blood volume within the glomerulus creates an increase in blood pressure. The glomerular blood pressure provides the force for glomerular filtration. The result of glomerular filtration is the production of glomerular filtrate that consists of the same substances that compose blood plasma, except for plasma proteins that are too large to pass through the pores of the glomerular capillaries. Because glomerular filtration is a nonselective process, the concentrations of these substances are the same in both blood plasma and glomerular filtrate. Glomerular filtration rate (GFR) is about 125 ml per minute, or 7.5 liters per hour. This means that the entire volume of blood is filtered every 40 minutes! In 24 hours, about 180 liters (nearly 45 gallons) of glomerular filtrate is produced. However, most of the glomerular filtrate is reabsorbed, as you will see shortly. Maintenance of a relatively stable GFR is necessary for normal kidney function. The GFR varies directly with glomerular blood pressure, which, in turn, is primarily determined by systemic blood pressure. The GFR is regulated by three homeostatic processes: renal autoregulation, sympathetic control, and the renin-angiotensin mechanism. These processes operate primarily by controlling the diameter of afferent glomerular arterioles to keep the GFR within normal limits. Renal autoregulation is the mechanism that keeps the GFR within normal limits, without extrinsic neural or hormonal control, in response to moderate variations in systemic blood pressure. One way this occurs is by the response of smooth muscle in the afferent glomerular arteriole wall to blood pressure changes. If the afferent glomerular arteriole is stretched by increased blood pressure, it contracts; the smaller diameter of the afferent glomerular arteriole means less blood volume enters the glomerulus, thus decreasing blood pressure within the glomerulus. A decline in blood pressure causes the arteriole to dilate, which keeps the GFR stable. Another autoregulatory mechanism involves the juxtaglomerular complex. The juxtaglomerular complex monitors the GFR by using the macula densa to sense changes in the flow rate and chemical composition in the tubular fluid of the ascending limb. If the GFR increases, the granular cells constrict the afferent glomerular arteriole, keeping the GFR normal. If the GFR declines, the afferent glomerular arteriole relaxes to maintain a normal GFR. Sympathetic control is a function of the sympathetic division of the autonomic nervous system, which overrides renal autoregulation in times of large systemic blood pressure shifts or during the “fight or flight” response. If a drop in systemic blood pressure is detected, afferent glomerular arterioles are constricted, which decreases glomerular pressure and GFR. This decreases urine formation, which conserves water to maintain normal blood pressure and volume. If an increase in blood pressure is detected, the afferent glomerular arteriole dilates as a result of the sympathetic control being removed, which increases glomerular pressure and the GFR. This results in an increase in urine production and water excretion to maintain normal blood pressure and volume. The renin-angiotensin mechanism is triggered when the juxtaglomerular complex detects a reduced GFR and releases the enzyme renin. Renin is secreted in response to (1) sympathetic stimulation; (2) a drop in blood pressure in the afferent glomerular arteriole; and (3) detection of a reduction of Na+, K+, and Cl– levels in the tubular fluid in the ascending limb of the nephron loop by the macula densa. Renin converts a plasma protein (angiotensinogen), which is formed by the liver, into angiotensin I. Angiotension I is rapidly converted into angiotensin II by the angiotensin-converting enzyme (ACE) released from endothelial cells of capillaries in the lungs and other organs. Angiotensin II constricts the efferent glomerular arterioles to maintain blood pressure in glomeruli, which maintains an adequate GFR in spite of a decline in blood pressure. It also acts to restore blood volume and blood pressure by (1) constricting systemic arterioles; (2) stimulating aldosterone secretion by the adrenal cortex, which promotes the reabsorption of Na+, which in turn promotes the reabsorption of water by osmosis; (3) stimulating secretion of antidiuretic hormone (ADH) by the posterior lobe of the pituitary gland, which promotes water reabsorption; and (4) stimulating thirst, which promotes water intake. Atrial natriuretic peptide (ANP) is secreted by atria of the heart when they are stretched by an excessive blood volume. ANP promotes water excretion by increasing GFR, and inhibiting Na+ reabsorption in the DCT, which results in a decrease in blood volume and, in turn, a decrease in blood pressure. Tubular reabsorption and tubular secretion involve both active and passive transport mechanisms. The effectiveness of passive transport of any substance depends upon (1) the permeability of the renal tubule, peritubular capillaries, and vasa recta to the substance, and (2) the concentration gradient of the substance. About 65% of the tubular fluid is reabsorbed in the PCT. All nutrients, such as glucose and amino acids, are actively reabsorbed here. Positively charged ions, such as those of Na+, K+, and Ca2+, are also actively reabsorbed. The active reabsorption of positively charged ions causes negatively charged ions, such as Cl– and HCO3–, to be passively reabsorbed by electrochemical attraction. The reabsorption of these substances increases the osmotic pressure of the blood plasma in the peritubular capillaries and decreases the osmotic pressure of the tubular fluid. This causes water to be passively reabsorbed from the tubular fluid by osmosis. Tubular secretion is the process that extracts substances from blood plasma in the peritubular capillaries and secretes them into the tubular fluid in the renal tubule. Metabolic wastes, such as urea and uric acid, and drugs, are removed from the blood in this way. It not only removes unwanted wastes but also helps regulate the pH of body fluids by selectively removing H+ and HCO3– . Water is passively reabsorbed by osmosis from the descending limb of the nephron loop into the capillaries supplied by the vasa recta. The ascending limb is impermeable to water, but solutes are reabsorbed passively by diffusion from the proximal ascending limb. The ascending limb actively pumps Na+ out of the tubular fluid, and K+ and Cl– follow passively into the interstitial fluid. Some K+ reenter the tubule, but Na+ and Cl– remain in the interstitial fluid. The accumulation of ions in the interstitial fluid of the renal medulla establishes a strong osmotic gradient for the reabsorption of water from the descending limb and the collecting duct. Establishing this osmotic gradient is a major function of the nephron loop. Tubular secretion does not occur in the nephron loop. 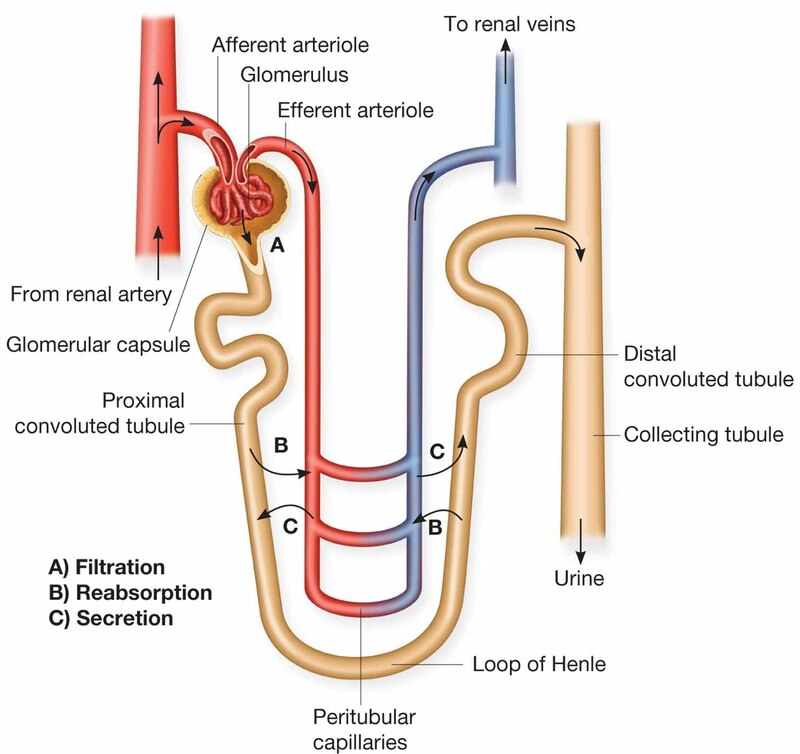 At the end of the nephron loop, the tubular fluid is quite dilute due to the removal of many solutes. It still contains about 20% of the water and 10% of the salts that were present in the glomerular filtrate. Reabsorption in the DCT is under hormonal control. The active reabsorption of Na+ from the tubular fluid into peritubular capillaries is promoted by the hormone aldosterone. Passive reabsorption of negative ions, such as Cl– and HCO3–, then occurs by electrochemical attraction. The reabsorption of ions decreases the osmotic pressure of the tubular fluid, which causes water to be reabsorbed into the blood plasma by osmosis. However, the amount of water reabsorbed from the tubular fluid in the DCT is controlled by ADH. Activating the renin-angiotensin system causes these two hormones to increase sodium and water reabsorption, which increases blood volume and blood pressure. Parathyroid hormone (PTH) and active vitamin D also affect the DCT. They control the amount of Ca2+ reabsorption that takes place in the DCT and are very important in maintaining blood Ca2+ homeostasis. Aldosterone release can also be triggered by increased blood K+ levels (hyperkalemia). Aldosterone causes the DCT to actively secrete K+ from blood plasma in the peritubular capillaries into the distal convoluted tubule. Hydrogen ions are also actively secreted, as necessary, to maintain the normal blood pH. When necessary, the DCT is the site of active and passive drug secretion and elimination. The tubular fluid entering the collecting duct is approximately isotonic with the blood plasma, so it still contains a lot of water. Once tubular fluid enters the collecting duct it is renamed urine. Because the collecting duct extends from the renal cortex through the renal medulla to the renal papilla the concentration of ions in the surrounding interstitial fluid increases along the length of the collecting duct. Recall that Na+, K+, and Cl– have been moved into the interstitial fluid by the ascending limb of the nephron loop. This creates a strong osmotic gradient that causes the passive reabsorption of water from the urine in the collecting duct by osmosis. The reabsorption of water causes the urine to become concentrated and hypertonic to blood plasma by the time it exits the collecting duct. The reabsorption of water from the collecting duct is regulated by ADH, which increases the collecting duct’s permeability to water. Only 1% of the original glomerular filtrate volume remains as urine. The volume of urine produced in a 24-hour period usually is 1.5 to 2.0 liters. In healthy persons, fresh urine is usually clear with a pale yellow to light amber color and a characteristic odor. The color is due to the presence of urochrome, a substance produced by the breakdown of bile pigments in the intestine. The more concentrated the urine, the darker is its color. Urine is usually slightly acidic (about pH 6), although the normal pH range extends from 4.8 to 7.5. Variations in pH usually result from the diet. High-protein diets increase the acidity. Conversely, vegetarian diets tend to make the urine more alkaline. Urine is heavier than water because of the many solutes it contains. The term specific gravity is used to compare how much heavier urine is than water. Pure water has a specific gravity of 1.000, and the specific gravity of normal urine ranges from 1.002 (dilute urine) to 1.030 (concentrated urine). Specific gravity is a measure of the concentration of a urine sample. Substances not normally found in urine are glucose, proteins, formed elements, hemoglobin, and bile pigments. The presence of any of these substances suggests possible pathological conditions. Normal values of urine components and some indications of abnormal values are listed on the inside back cover.